Bathroom areas are an integral part of modern appartments and should be treated with special care. Here, to rejuvenate your senses, is Irene Samoylova with a wonderful creation named Live bath-anemone. The dainty bathtub will change the whole look of contemporary bathrooms. It will unfold complete comfort and help users kill their stressful state. Getting a massage is the best way to soothe the frazzled nerves. This means going to a swanky salon, which is not possible every day. But, this device will act as a perfect massager and help you relax every single day. It has been given a wavy shape and resembles a fluffed-up cloud. The inside of this eye-catching product comes caked with small finger shaped structures. These blue colored, little fingers work like sea anemones. The fingers move up and down because of the water pressure produced inside them. When someone lies inside the tub, the upward and downward movement lets the user feel as if someone is massaging his/her body. The whole working, in terms of suppleness, has been stirred from the movement of sea anemones. The product is aesthetically pleasing and manages to fetch a lot of attention. It comes fitted with lights that illuminate the fingers, giving birth to a spectacular view. The shade of light produced fluctuates depending on the temperature of water, which creates a tasteful effect. 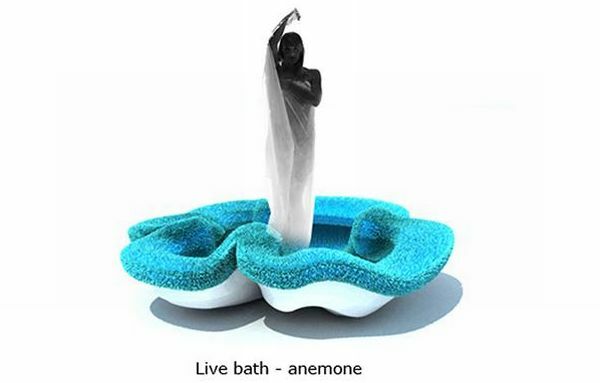 Live bath-anemone will prove to be comfort zone installed in your house. So, untwine all the stress and lead a healthy life! LM project: An architectural marvel!